FULTON, NY – Oswego County Opportunities honored John Zanewych with its prestigious Howard Wilcox Volunteer of the Year Award. 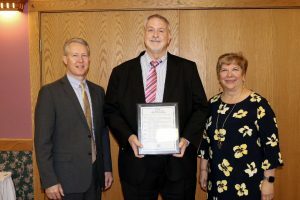 OCO Board President Jeff Coakley (left) and OCO Executive Director Diane Cooper Currier present OCO board member John Zanewych with the Howard Wilcox Volunteer of the Year award for his volunteer spirit and selfless commitment to OCO. One of the board’s most active members, Zanewych attends OCO staff recognition events to share his thanks for their contributions to OCO. He has also participates in OCO’s March for Meals campaign and volunteers at the agency’s dining and activity centers.